In its breathtaking position at the edge of a cliff and with elegant yet informal atmosphere, enhanced by a magnificently illuminated ceiling and traditional woven lamps, the Sangkar Restaurant offers a menu of international specialities, creatively combining typical Indonesian dishes with contemporary culinary techniques. Open all day for guests to enjoy dishes such as tamarind chicken breast or bamboo shoot and vegetable curry with turmeric-scented rice. Executive Chef Andrew Skinner suggests a selection of whole live lobster, an experience that will engage the senses and please the most discerning of palates. Sangkar Restaurant is also the setting for authentic Indonesian cuisine created by Executive Sous Chef I Wayan Wicaya - winner of World Association of Chefs Society (WACS) Global Chef's Challenge 2010 in Santiago, Chile. 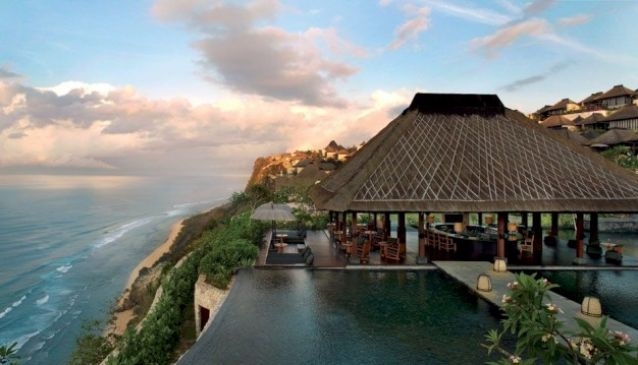 Every day, starting from 6.30 p.m. guests will enjoy his 4-course menu, featuring Balinese cuisine at its best.